Sir Thrift A lot: Thriftasaurus #12! It's December, a couple more weeks until Christmas & I have yet to put up my tree! No Christmas bulbs!! Ahh! I had been watching closely, very closely, this set of vintage pink ornaments, absolutely perfect, with very low shipping... about $11, when other people want $45 for one box of Shiny Brites (!!!). That ended & it went above what I could pay at the time.. too angry. This weekend I had company (hence the lateness of Thriftasaurus) & my sister told me about one of our cousins husbands side businesses - he has a US address & Canadians can pay him to have the items shipped to his US address & they come & pick it up. My father has stuff shipped all the time (free for family, of course!). 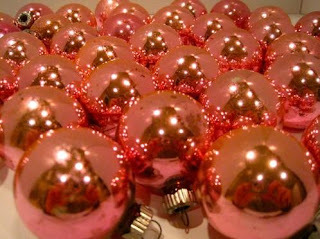 So I've got another year to look for these bulbs & can have them shipped to the US address to save on shipping. 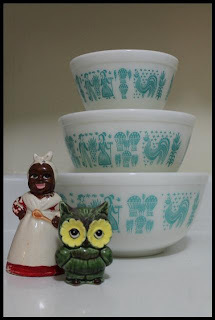 Last week I posted a dishwashed 402 Butterprint bowl I saw at Salvation Army for $7.99 in the feature "What I Didn't Buy At The Thrift Store"... well, this week, for the total of $8.97 got a mint set of Butterprint mixing bowls (minus the 404... tots need that bowl still!). Value Village. These Smurfs plastic tumblers from 1985 by Peyo were $1.99, for all of them. All 31 of them. I was nervous to tell my BF I bought them, but he didn't seem to mind, lol. A mashup between the Smurfs, McDonald's & Canada's Wonderland. Made in Canada. To be listed on eBay later this week, just gotta get some shipping costs - vintage Strawberry Shortcake fabric. As you can see, Sir Thrift-A-Lot is still a little messy. There are some things with the blog I still can't get a grasp on.. any help out there? I also just can't for the life of me create a banner that suits me & my blog, although I do have one that I am inspired by: http://www.knifeparty.org/. Going to be joining up with A Living Space this week! Thanks for linking up last week, can't wait to see what everyone finds this week! Thriftosaurus Thrift Haul Linkup #12! Those are wonderful Butterprint bowls. I occasionally run across them, but they are always in terrible shape. Faded from too many trips through the dishwasher. I can't believe how lucky you were to find those three Butterprint bowls at that price! We would have definitely had a lot of fun had you been at our little wreath making party. We had plenty of champagne. When my sister comes to visit, I make sure to stock up! Awwwe, thanks so much Melissa! Pink is so hard to find. Everyday I go to Goodwill I'm like "this is the day." Nope! Never has been ... yet. I'm going to be listing on eBay, will be posting within the week. I'll be posting the link on my blog, so check back soon! Great bowls, thanks for hosting! Love the bowls! and I totally remember getting those Smurfs cups from McD's ~ brings back good memories!! Doesn't it make you feel giddy when you find a set of bowls for a price like that!! Great find! Awesome deal on the Butterprint by the way! That's not too bad. Thanks for the link, but I'm in Canada, yet another seller who doesn't ship to us. They won't be able to make it home if I get them shipped to my cousins husbands business! Oh no! I forgot about that... I feel bad for getting your hopes up! I went looking through Etsy and it's amazing how many people don't ship to Canada, what's that about?! The only ones I could find were hot pink instead of that nice lighter pink, but at least they ship to Canada? Now I'm determined to find some good ones for you! I actually find it a bit depressing how many people won't ship to Canada.. It's OK, don't worry about it! We're going to get some from the dollar store & I have some pretty owl ones I can use this year. Joining in for the first time -- thanks! When did eBay shipping become so outrageous? I don't buy much via eBay, but it seemed to me the last time I ordered things regularly (a year or two ago), it was easy to find reasonable shipping fees. Now shipping to Canada often costs $25-$45, which kind of undermines the value of any deal. Etsy listings often seem to list much cheaper shipping (that is, when they ship to Canada at all).